Most of our designer dog leads are handmade for us here in Britain. Each one is made from the finest materials, whether it's a luxurious padded leather dog lead you are after or a fabric dog lead in a range stylish colours and patterns, you are sure to find the perfect designer dog lead here. Many of our dog leads have matching dog collars so you can complete the look. Whether you are looking for a leather dog lead, faux leather dog lead or a stylish fabric dog lead, we have a selection of designer dog leads that are sure to please. Not only that but also most of our dog leads are handmade here in the UK. Most of our dog leads have matching dog collars so you can co-ordinate your dog’s look. Some of our luxury leather dog leads are available in two widths, a slim width for small breeds and a thicker width for medium-large dog breeds. Our range of dog leads and leashes come in such a variety of colours and materials suitable for little princes, princesses and the city and countryside chic dogs alike. 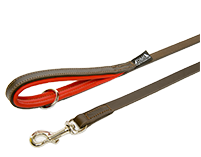 At Chelsea Dogs we have dog leads from top UK designer brands including Dogs and Horses, Mutts and Hounds and Scrufts.